“There a small corner of Tuscany which will always feel like home to me. It lies along the coast between the southern tip of Liguria and the northernmost point of the region, stretching inland to the foot of the Appenines on the Emilia Romagna border. It is known as Lunigiana, and is quite genuinely the land of my forefathers. My mother was a descendant of the Sforza dynasty, who ruled areas of these territories for many decades. This recipe is taken from Valentina’s book “Recipes from an Italian Terrace” published by Cassell Illustrated. For details on Valentina’s Cookery Holidays visit www.villavalentina.com or call +44 (0)20 8480 8367. A semifreddo is almost ice cream, but not quite! 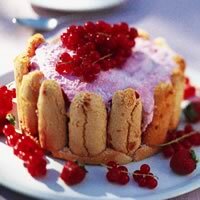 This is a very light, easy, pretty dessert to enjoy at the end of a long lazy lunch on the terrace or in the garden. You can use any berry you like. 2 egg whites, chilled; raspberries for decorating. Cut the biscuits in half, spread with the jam and line 4 individual moulds on the bottom and sides with the biscuits. Drizzle them with the sherry or dessert wine to moisten. Put the lemon juice and the berries in the food processor with the sugar. Whizz until smooth, then sieve to remove all the seeds. Pour the result into a bowl. Whip the cream and fold into the raspberry puree. Beat the chilled egg whites until really stiff and fold them into the mixture gently. Use this mousse mixture to ﬁll the 4 lined moulds. Place the ﬁlled moulds on to a tray and slide into the freezer for at least 2 hours. To serve, dip the moulds into hot water for 10 seconds, then turn out on to plates, decorate with a few berries and serve at once.